The Portland Cello Project plays in venues across the nation, from concert halls to loading docks. The ten-piece ensemble introduces audiences to everything from cello-only arrangements of classical music to adaptations of Kanye West. 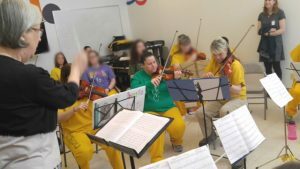 One of their most recent stops was in the orchestra room at Hiland Mountain Correctional Center, a women’s prison located in Eagle River. 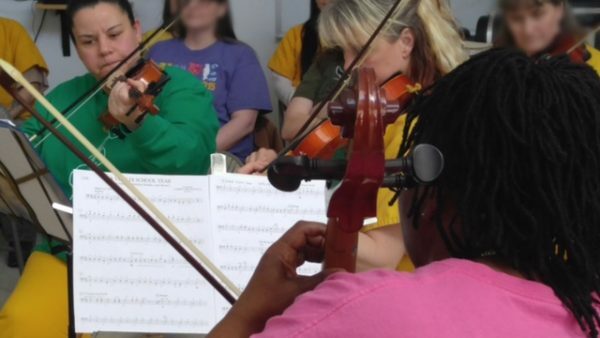 The facility started its own orchestra more than a decade ago. Members of the Hiland Mountain Correctional Center Orchestra sit in the brightly painted tile room warming up on their instruments. Among them is Winona Fletcher, who’s been in prison for 33 years. She joined the program five years ago because by that time, she had already gone through all of the institution’s other rehabilitation programs, she said. Though Fletcher’s played for audiences of 300 people during the orchestra’s annual holiday concerts, she still found playing for the four-members of the Portland Cello Project nerve-wracking. “’Cause you don’t want to mess up, but then you know that we haven’t been playing these songs very long so… You always want to do better for people who you know who are professionals,” Fletcher explained. Portland Cello Project Artistic Director Douglas Jenkins said this is the first time the ensembles has worked with a prison orchestra. 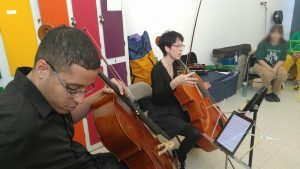 “One of the big missions of Portland Cello Project has always been to bring the cello to places you wouldn’t normally see it in order to bridge communities together,” Jenkins said. Jenkins explained the cello is a powerful instrument because its tones echo the range of the human voice and they want to show people it’s not just a vehicle for Beethoven and Bach. The violin plays many roles in Hunicke’s life. It’s a connection to her stepdaughter who is learning the same instrument, and the vibrations heal her spiritually. She also sees it as a way to give back. For Fletcher, learning new techniques from the Portland Cello Project and listening to them play gives her something to aspire to. The Portland Cello Project is playing a concert for all of the women at Hiland and will be at the Anchorage Performing Arts Center this weekend.